Jared Terrell (32), here shaking hands with teammate Stanford Robinson, leads Rhode Island in scoring. Coaches: John Giannini, 14th season at La Salle (210-222, 504-371 overall); Dan Hurley, 6th season at Rhode Island (107-78, 145-101 overall). Series: Rhode Island leads, 26-9. Last meeting: E.C. 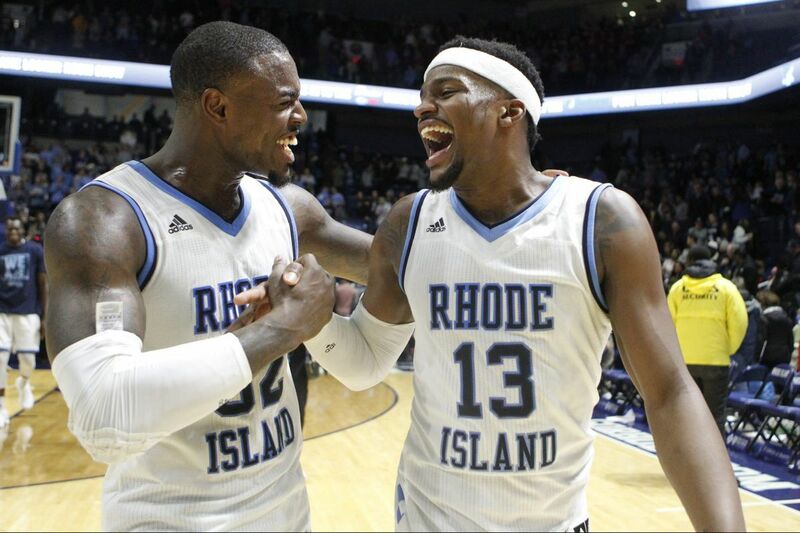 Matthews had a season-high 24 points with six rebounds to send Rhode Island to a 74-62 win Jan. 3 in Kingston, R.I. Isaiah Deas scored 17 for La Salle, which was without B.J. Johnson. The latest: The Explorers (11-16, 5-9) received a career-high 20 points and 14 rebounds from senior center Tony Washington on Saturday in a victory over George Mason that broke a four-game losing streak. La Salle needs a strong finish to place at least 10th in the standings and avoid an opening-round game in the A-10 Tournament. The 18th-ranked Rams (21-4, 13-1) saw their 16-game winning streak snapped with a loss at St. Bonaventure on Friday. Rhode Island can clinch a tie for the A-10 regular-season title with a victory. The Rams are second in the A-10 in scoring (77.3 ppg), which does not bode well for the Explorers, who are 11th in scoring defense (74.7 ppg.) Jared Terrell leads Rhodey with 17.7 ppg.